Dimensions 2.50 by 8 by 10 in. American literature; Southern States; Encyclopedias. Authors, American; Homes and haunts; Southern States; Encyclopedias. There are many anthologies of southern literature, but this is the ï¬rst companion. Neither a survey of masterpieces nor a biographical sourcebook, The Companion to Southern Literature treats every conceivable topic found in southern writing from the pre-Columbian era to the present, referencing speciï¬c works of all periods and genres. Top scholars in their ï¬elds offer original deï¬nitions and examples of the concepts they know best, identifying the themes, burning issues, historical personalities, beloved icons, and common or uncommon stereotypes that have shaped the most signiï¬cant regional literature in memory. Read the copious offerings straight through in alphabetical order (Ancestor Worship, Blue-Collar Literature, Caves) or skip randomly at whim (Guilt, The Grotesque, William Jefferson Clinton). Whatever approach you take, The Companionâs authority, scope, and variety in tone and interpretation will prove a boon and a delight. Explored here are literary embodiments of the Old South, New South, Solid South, Savage South, Lazy South, and âSahara of the Bozart.â As up-to-date as grit lit, K Mart ï¬ction, and postmodernism, and as old-fashioned as Puritanism, mules, and the tall tale, these ï¬ve hundred entries span a reach from Lady to Lesbian Literature. The volume includes an overview of every southern stateâs belletristic heritage while making it clear that the southern mind extends beyond geographical boundaries to form an essential component of the American psyche. The Southâs lavishly rich literature provides the best means of understanding the regionâs deepest nature, and The Companion to Southern Literature will be an invaluable tool for those who take on that exciting challenge. 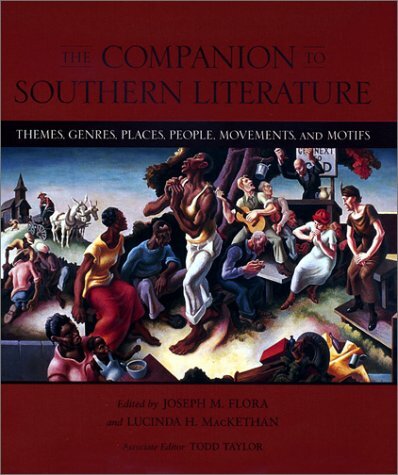 About: 'Solidly authoritative and comprehensive, The Companion to Southern Literature spans the genres, languages, ideologies, events, culture, literary history, works, and writers that comprise the literature of the South.